Redesigning and realigning part of a bridge is a daunting task, one that engineering students at the University of New Brunswick are up for. 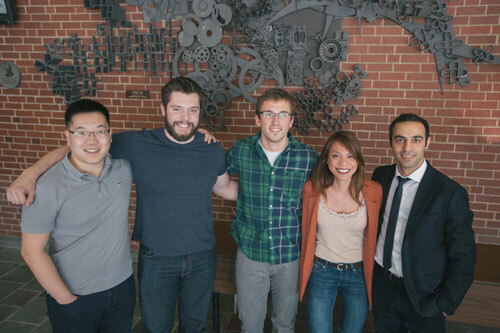 The senior civil engineering group, consisting of Mitchell Conrad, Amirnezam Fahkroo, Shaopei Duan, Chris Barrett, and Arianne Basuel, is working to redesign and realign the northern approach of the Tobique River Bridge. There are many varied interests and constrains the group has to take into consideration for this particular project. Time plays a big role, as the rehabilitation of the rest of the bridge is already underway. “This is a multi-phase project. The centre of the dam has already been rehabilitated, and the southern approach will be going through the process next,” said Mr. Conrad. Many engineering groups completing a senior project work with an industry partner. For this project, the students are working with the New Brunswick Department of Transportation and Infrastructure. However, the approach falls on land owned by a First Nations community in the area, making it another project partner whose interests need to be addressed. This isn’t a straightforward bridge construction. Due to the angle of the approach, there’s a blind hill. The group will also be realigning the approach to provide more safety. The bridge will also need to be shut down during some phases of the construction, resulting in two 45-minute detours. Mr. Barrett said that time is necessary for the demolition, realignment and installation. In order to lessen that time, the group researched options and decided upon a prefabricated structure, which would be assembled elsewhere before being affixed in place. The students have been working with mentors and advisors, who have helped guide them in the right direction and offer feedback. The group provided its mentors with six options for this project, and both have agreed with the group’s preferred method. Having that industry input for a project of this magnitude has been invaluable for the students, some of whom will be graduating and entering the workforce this spring. The group will present the project in its entirety at the UNB Engineering Design Symposium on March 31, 2016 at the Fredericton Convention Centre. The symposium will feature approximately 300 UNB senior engineering students and their capstone design projects. The event is open to the public.